Order your Lanyards with breakaway clips for safety. If your lanyard gets caught in machinery or is grabbed by someone, the ‘Breakaway’ clip comes apart. For your safety we supply a variety of Different Breakaway lanyards meeting OH&S standards. The heavy duty clip, standard clip and the round Alligator clips are included in this range. Lanyards also come in various sizes. 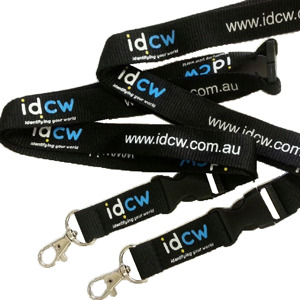 You can choose from swivel or alligator clips, Choose 15 mm or 20 mm, Cord or Flat Lanyards. For a professional look, why not get a custom made design incorporating your company logo. Single side or dual sided printing in multiple colours also available. Choose different types of cord. Note: Other colours available on request.